Like many charities Hope and Homes for Children have limited resource, so their website is a key marketing tool which needs to work as hard as possible to tell their story and inspire action. The previous site wasn’t projecting a strong message or delivering on objectives. So in 2011 the charity enlisted help from digital agency Positive to create a new site that would raise their profile, educate and inspire their audiences, and recruit new supporters. At the charity, a cross-organisation group was set up to help steer the project and Positive worked closely with them throughout. This helped balance the needs of users with those of other stakeholders and kept the project focused on its objectives. After their research was complete and the specification finalised the project was split into defined phases with agreed deliverables, which helped manage expectations internally. 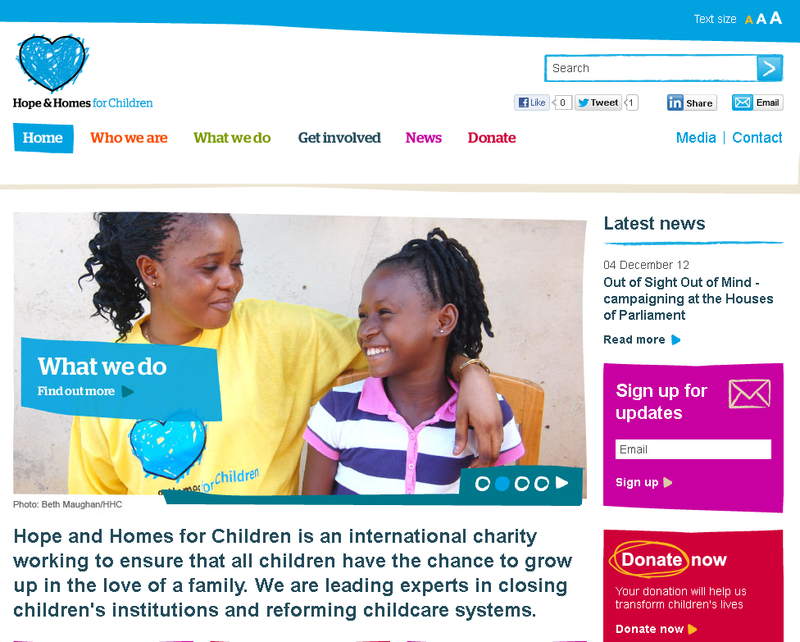 Hope and Homes for Children have great content, but most of it was hard to find on the previous site, so a detailed architecture phase was undertaken to help the charity think about how differing audience groups would interact with their site. The aim was for all users to find relevant content easily but maintain the level of detailed information that is so key to the charity’s story. The result is a clear site structure, targeted page content and an intuitive navigation. Working with the charity’s refreshed branding, Positive created a design that retains the child-like feel of their brand, while remaining professional and friendly. Combined with strong imagery, the user quickly gains an insight into the charity and the work they do. With such an emotive story to tell, balancing reasons for donating with the call to donate was always going to be key. By visually promoting where your money goes the user feels connected with the work of the charity and never bombarded with ‘the ask’ (though the option to donate is accessible). The donation process was streamlined to make it as simple and encouraging as possible, interactive maps allow users to find the nearest fundraising groups. The website is integrated with a content management system that allows the team to change and edit all the content themselves. Making updates easy to perform has resulted in staff wanting to be more involved with the website. Since the project, Hope and Homes for Children enjoy improved cross-team working and online activity, and use of social networks has increased dramatically. News updates on the site have increased to two per week from around two stories per month, which has been an important factor in web traffic growth. Twitter followers have increased by 27%, Facebook likes by 39%, video content has proved hugely popular – YouTube views as of July stood at 10,189 (up 1,043%). The feedback, both internally and externally, has been fantastic. Since the site was launched website visits have gone up 69% and newsletter subscriptions by 342%. Regular giving is up 165% year-on-year and individual donations have increased by 122%. Within three months of the site going live, Hope and Homes for Children was approached by a philanthropy advisor representing a family trust. They were impressed by the clarity of message on the website and the ability to contact the right person directly from the Grants and Major Gifts page. This resulted in the charity being awarded a substantial grant – in their eighteen year history this was the first proactive approach to offer a grant tendering opportunity they had ever received via the website. To further reinforce the success and impact of the project, the Hope and Homes for Children website has gone on to win a Design Effectiveness Award from the Design Business Association (DBA).